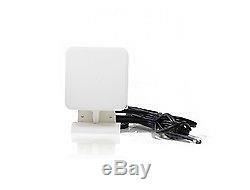 Lancom AirLancer Extender O-360-4G Omni-directional antenna RP-SMA 5dBi network antenna. Prodotto Nuovo di fabbrica, nella sua confezione originale di vendita (o "bulk" se specificato altrove), mai aperto, mai usato. Spedizione Corriere Espresso, con assicurazione inclusa SEMPRE! Lancom Systems AirLancer Extender O-360-4G. Antenna gain level (max): 5 dBi, Frequency band: 0.8 - 0.96 / 1.71 - 2.17 / 2.4 - 2.7, Gain: 2 / 4 / 5. Antenna type: Omni-directional antenna, Antenna connector type: RP-SMA, Gender: Male. Width: 155 mm, Height: 186 mm. Connector(s): 2 x SMA. Frequently, the cellular signals received by a router inside a building are too weak to reliably support a network. 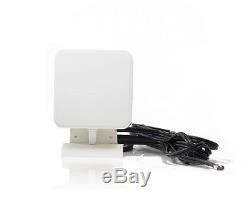 In such cases, the installation of an outdoor antenna on the building's outer facade is recommended. It receives the signal outside and transfers it to the router inside the building. The AirLancer Extender O-360-4G is an outdoor antenna that operates not only with LTE/4G signals, but also GSM, EDGE, UMTS/3G, and HSPA+. The integrated MIMO technology brings higher data rates and a better transmission quality in combination with LTE/4G. Particularly in built-up areas, where the Fresnel zone to the provider's base station is unlikely to be free of obstructions, reflections are ideal for transmitting signals to and from the MIMO antenna. The supplied mounting accessories allow for fixing the antenna directly to a building facade or on a mast. Please note: home appliances shavers, kitchen machines, coffee machines, ecc. On sale at our store are intended for use at 220-240 Volts and in some cases at 100-240 Volts as well. We accept bank transfer too: in USD to an American bank account, in GBP to a UK bank account and in Euro to an Italian bank account. Dormi sonni tranquilli: se i prodotti si rivelano difettosi, se non sono compatibili, se non corrispondono alla descrizione o se semplicemente non ti piacciono, contattaci entro 60 giorni dalla ricezione. Ti aiuteremo a restituirceli per un cambio o un rimborso. Prodotti 100% originali, nuovi di zecca - eeemarket non vende prodotti usati o contraffatti - MAI! Lasciamo il feedback positivo per primi. We are the Hi-Tech Lovers. And we're keeping on loving this job! Hope you will appreciate our seriousness and reliability. You can always count on us! For any information, we're here! The item "Lancom AirLancer Extender O-360-4G Omni-directional antenna RP-SMA 5dBi" is in sale since Monday, October 8, 2018. This item is in the category "TV, audio e video\Decoder, satellitari e DTT\Amplificatori e filtri segnale". The seller is "eeemarket" and is located in Interporto Nola Italy.